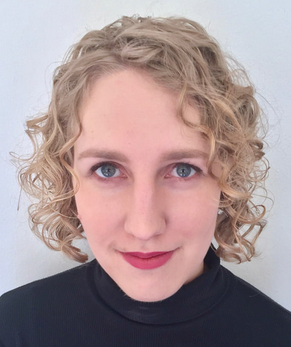 Pirates, and Puppets, and New Plays: OH MY! 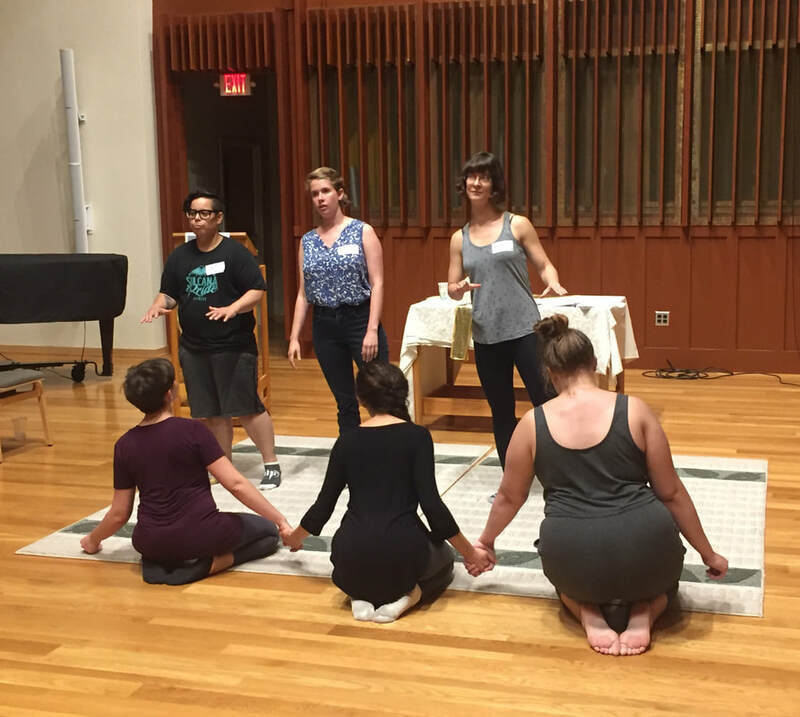 This fall has been busy for Collective Unconscious Performance! While David and the French Ladies were sipping champagne, I dove into a workshop for one of our future works. 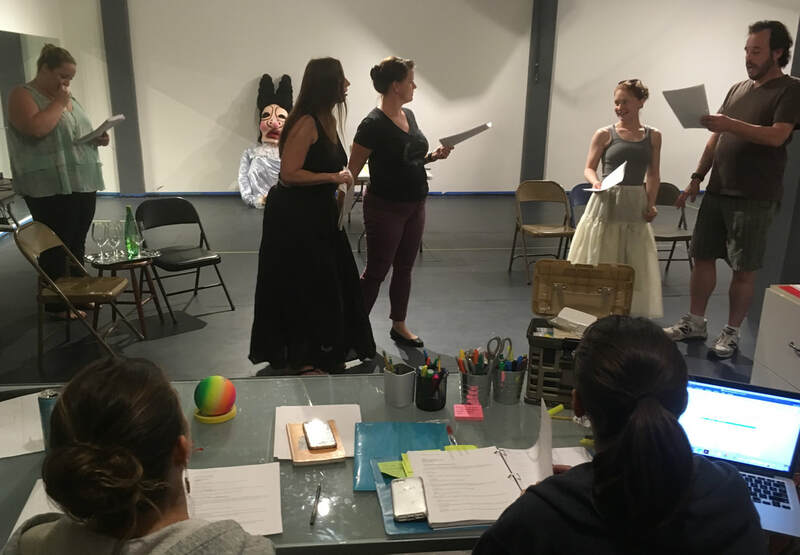 Inspired by an old tale by Rabbi Nachman, this new play about femme pirates will follow a headstrong young woman and her crew as they sail into a life of piracy. These clever seafarers will battle sea monsters, and monstrous sea men, with wit, charm, and (of course) some puppets! This play has been a dream of mine for almost five years. I first encountered the story in a beautiful children’s book called The Serpent Slayer: and Other Stories of Strong Women compiled by Katrin Tchana, and illustrated by Trina Schart Hyman. It follows a clever princess named Judith who must run away from her home to be with her lover but she and the beau are shipwrecked and separated. Judith vows to be reunited with her love but along the way, she meets men who keep trying to marry her. In each case, she agrees to the wedding but tricks her suitors at the last minute and kills them, captures their ladies in waiting, or steals their treasures. Eventually, she assembles a mighty crew of lady-pirates and by a strange miscommunication, ends up as the king of another land! Needless to say, I was head over heels for this fast paced adventure that lets a princess have all the fun and “close-calls” of the stories from my childhood that seemed to be reserved for courageous (male) royalty and benevolent (male) street urchins. 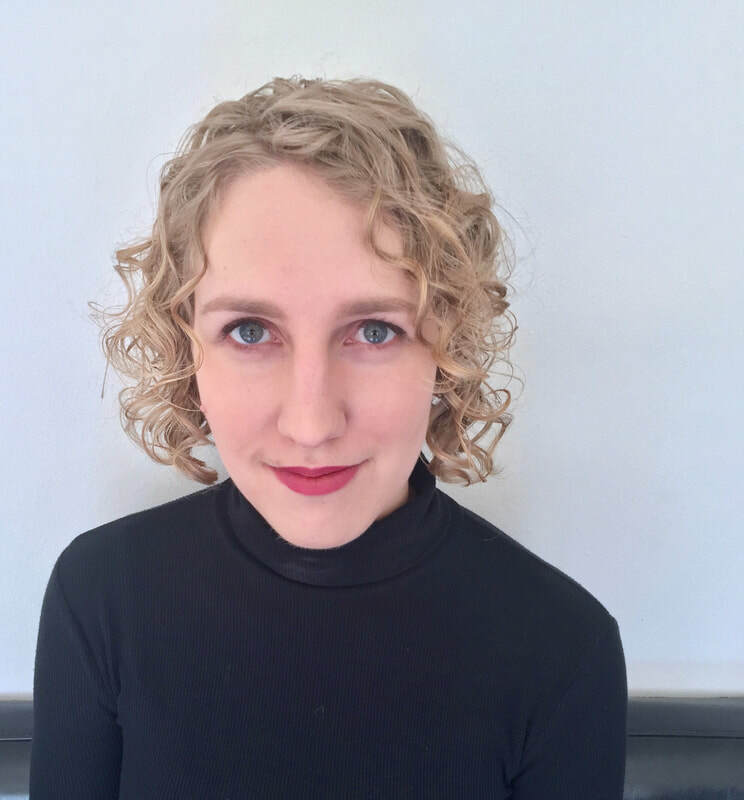 It inspired me to stage a play that lets women and queer folks move through a traditionally masculine narrative without question, judgement, or being “saved” by another character. What happens if the crew encounters sea monsters from our collective remembering of sea tales? What if they meet a cyclops, Poseidon, the shark from Jaws? Is our main character a princess? 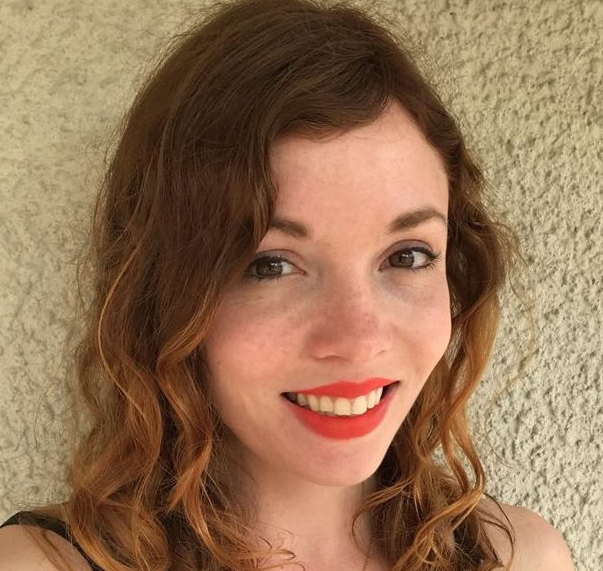 Does she need to chase after her prince? What is funny about this narrative? When do we need to take this seriously? What benevolent sexism from our own lives has a home in this story? 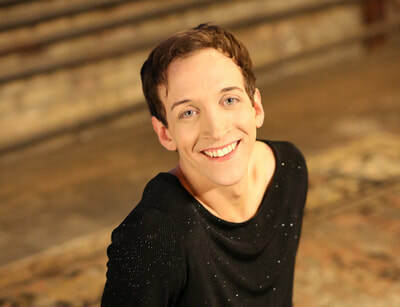 I had the absolute privilege and delight of working with some of the most creative, sensitive, and silly performers in town: Addison Sharpe, Bethany McHugh, Jasmine Porter, Jex Arzayus, Mickaylee Shaughnessy, Morgen Chang, Nora Huxtable, Stephanie Johnson, Stephanie Ruas, Suzi Love, and Victoria Pyan. Based on the content we generated, I will be creating a new draft of the script that we will workshop again in early 2019. We’ll be sure to keep you all posted on upcoming workshops and public readings over the next year! It’s been almost exactly a year since we shot our short film, Little Red. Our cast and crew definitely lucked out, as Minnesota last October was an autumnal paradise (sorry about that early snowstorm, everybody!). 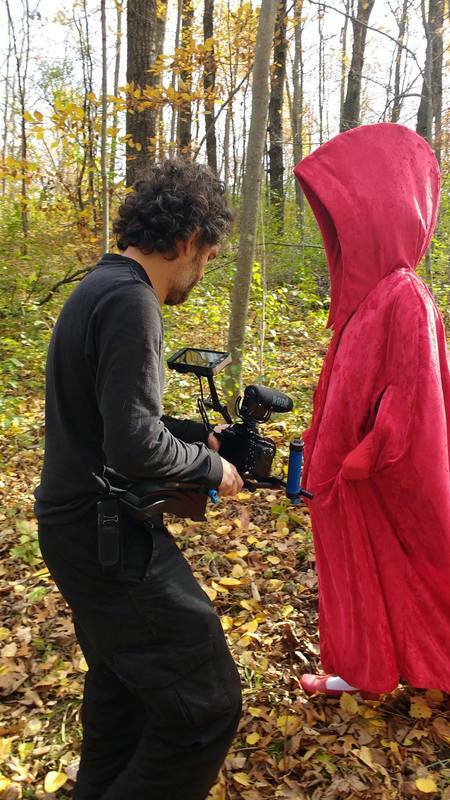 Director of photography Joe Valenzuela and actor Angela Olson shoot a scene from Little Red in the woods of Lindstrom, MN. After spending all last winter in post-production, we realized our film out into the world this spring. 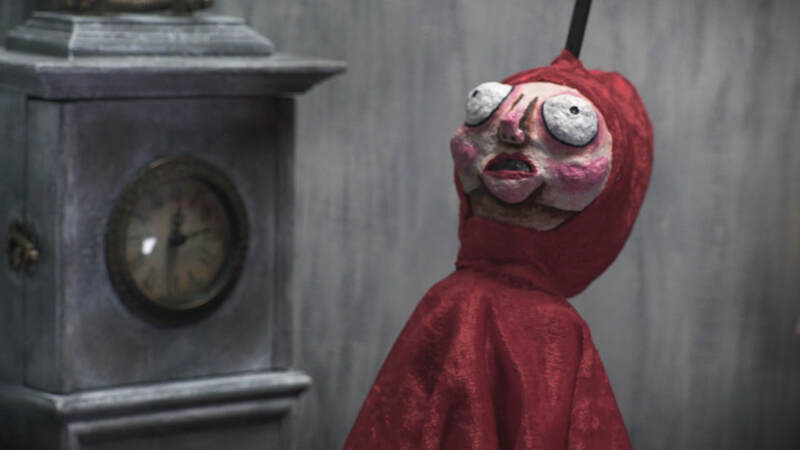 So far, we’ve had the pleasure of screening Little Red at several festivals, including the Artists Forum Festival of the Moving Image, NewFilmmakers NY, and the Austin Spotlight Film Festival. And in November, we’ll have another screening in NYC, as we’re an official selection of the New York Short Film Festival. 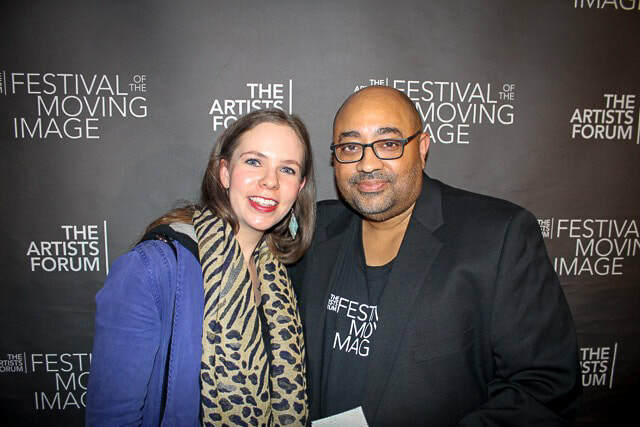 Co-director Laura Lechner and Artist Forum festival director Amos White V after the Little Red screening. It’s been a pleasure watching our film on the big screen. Even though I spent hundreds of hours as the editor of the film watching and re-watching (and re-watching and re-watching...) it, it was truly special to see and hear it larger than life, and with an appreciative audience. So far, Little Red has been very well-received. 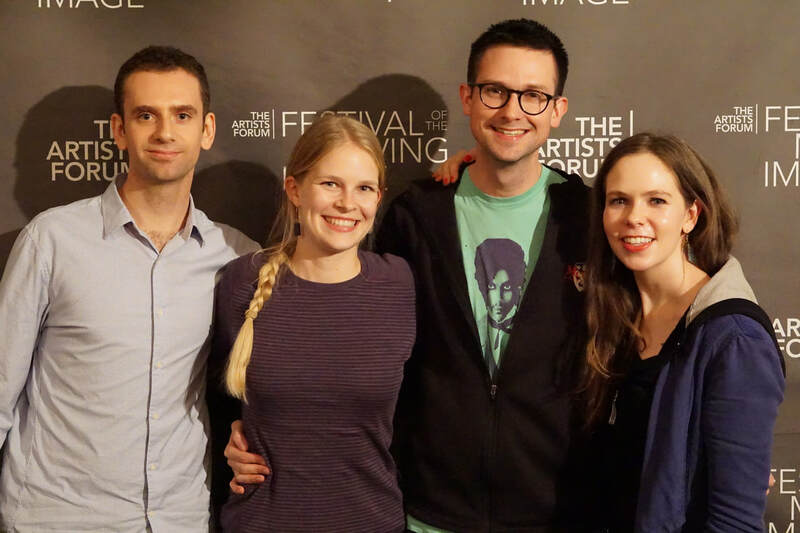 At both NewFilmmakers NY and the Artists Forum festivals, I was able to participate in a Q&A, and the audiences asked thought-provoking questions. One of the joys of art-making is to hear how others interact with your work, and in both my formal and informal discussions with audience members, I gained new insights through different viewer’s interpretations of the film. Laura with film contributors Nick Buonincontri, Emily Helgerson, and Brad Horras. At the Artists Forum Festival of the Moving Image, David and I were nominated for Best Director. I was proud to accept this recognition on behalf of the two of us, and am happy that our work was recognized out of 40 short films that screened at the festival. I know both David and I are excited to continue to share Little Red. We’ll keep you posted about any and all opportunities to watch our film. We hope to have a screening in Minneapolis, sometime soon! Goodbye to "Le Cirque Féerique"
I can't believe that Le Cirque Féerique (The Fairy Circus) closed nearly two weeks ago. Thank you to our brilliant actors for working so hard at developing this brand new script, our designers for making them look fabulous, our stage management crew for keeping us on task, and to our audiences for supporting new work. I was so sad to say goodbye to this show (and the dream cast!!!) after spending over a year working on it, but I suspect that this isn't the last time that you'll see this show. I hope to revisit it someday, sometime soon. THANK YOU!!! Le Cirque Féerique rehearsals begin! WOW! I can’t believe that the first week of rehearsals has already come and gone - it has been a whirlwind. As I prepared for our first day together at the start of last week, I couldn’t help but feel first-day-of-school-like jitters. These characters and this story had been rolling around in my brain for well over a year, be it leading a research group, collaborating on a script with a playwright, facilitating script development workshops, or fabricating a plethora of puppets and masks. 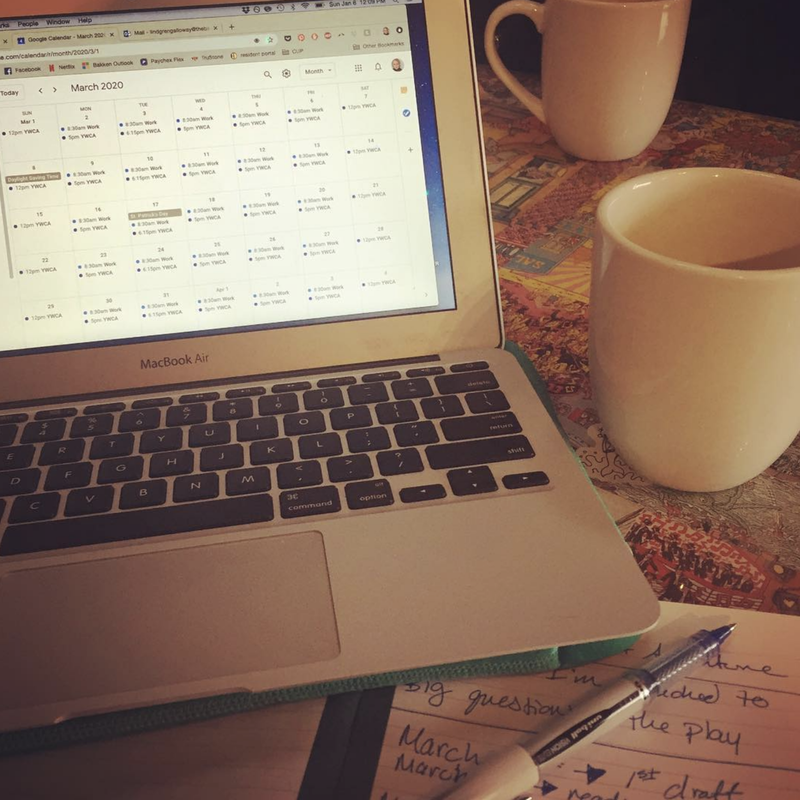 But no matter how long you research or rewrite, preparing for the first day of rehearsal for what will be a world premiere script is always a little extra nerve-wracking. Leading up to our first day of rehearsals, I was plagued with insecurities. I knew that I (as the director/conceiver/co-creator) was still fascinated by our script and source material, but would actors (some of whom were brand-new to the project) feel the same way? Would the questions and themes that seemed so inspiring and resonant to my research group twelve months ago, still ring through as powerfully today? Luckily for me, my fears were instantly smashed after a few minutes on our first day together - our entire ensemble has been a dream to work with since day one, and I couldn’t feel more blessed to have this amazing collective of actors bring these characters to life for the very first time. 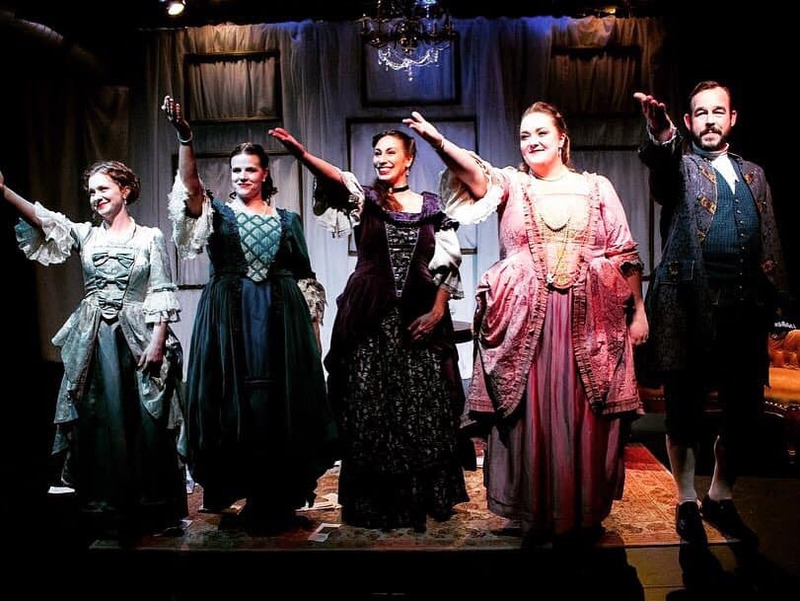 This world premiere production has been a glimmer in my eye ever since I first accidentally stumbled upon Madame Marie-Catherine d’Aulnoy and her real-life friends while researching for another project way back in March 2017. I instantly felt a kinship with these forgotten souls, and almost immediately felt compelled to bring their historically-erased lives and subversive tales to the stage -- it’s rare that I so hastily or impulsively commit to a theatrical project. I still remember reading about how Marie-Catherine d’Aulnoy helped her friend murder her abusive husband (and get away with it! ), or how Charlotte-Rose de Caumont de La Force dressed up as a bear in a traveling circus to rescue her imprisoned fiancé who she had been forbidden to marry. I remember immediately thinking -- these are my people and I have to tell their story!!! I think of the first day of rehearsal as a way of uploading everything that I have on to the ensemble’s mutual desktop. I always try to bring in every relevant scrap of research, every idea that the design team has arrived at thus far, every hunch, and every question. I always like to share -- What do I know about our play? What do I not know? What questions do I still have? What is still left for us as an ensemble to discover? 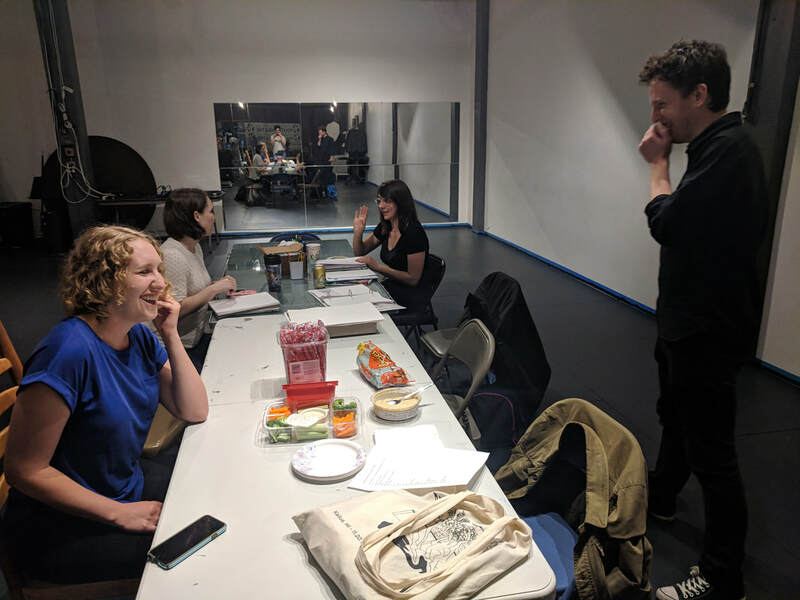 Over the last week, playwright Emily Dendinger has swooped in from New York City to “exfoliate” our script with us, cutting, revising, and rewriting our text based on the discoveries and choices that the ensemble has made around the table and on their feet. We’ve also started animating puppets in the rehearsal room, which has informed several script revisions and generated new moments onstage. 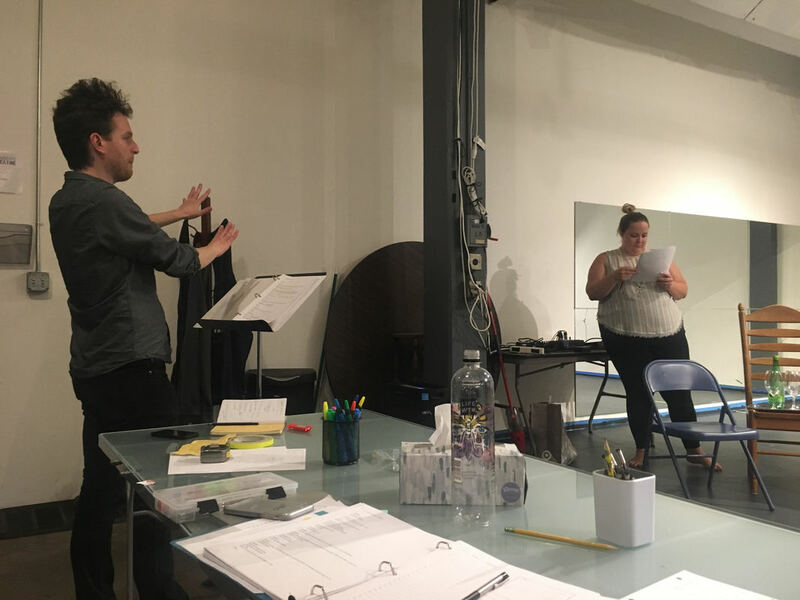 We still have a few more weeks of rehearsal before our week of technical rehearsals begin, and the only thing that’s certain for the future is that this script and production will change and evolve and grow based on the collective discoveries of the ensemble. I hope that you’ll join us this coming October at the Off-Leash Area’s Art Box - this is bound to be a special one, and I couldn’t be more excited. Onward! Even if you love working on new plays, and do so often, there is invariably the worry that the long process of gestation won’t culminate with the production you originally envisioned. And actually, if you’re lucky, what can sometimes happen is exactly that: You do not end up with what you originally imagined. You end up with something better. Rehearsals for the fall production of Le Cirque Féerique have not even started and the process has already yielded a work that has grown far beyond what I pictured when I joined the research group in October 2017. 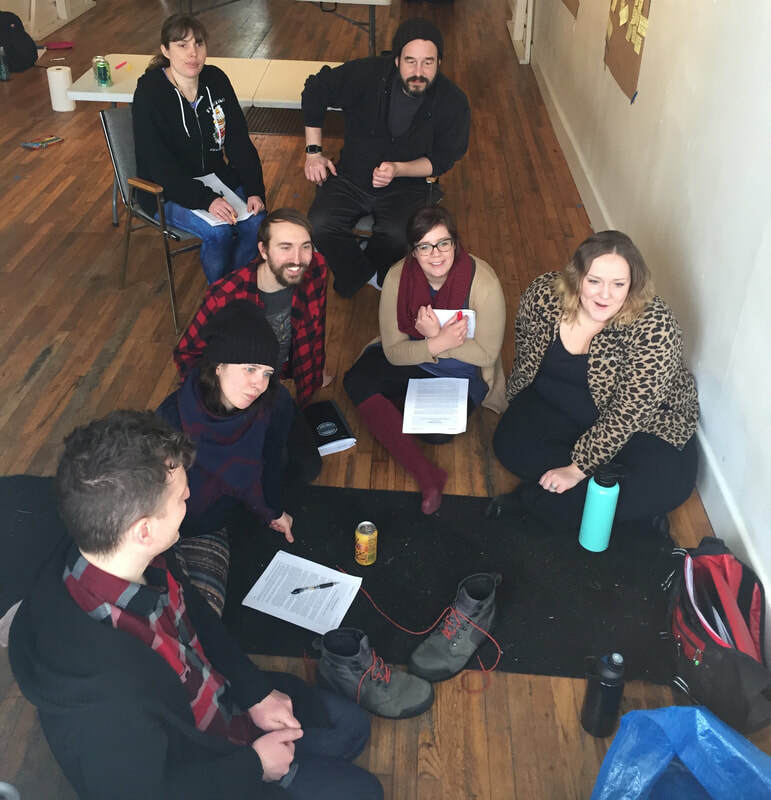 As a devotee to collaborating on new works, and a first time collaborator with Collective Unconscious, I was excited to work on a play that was being crafted from the ground up. 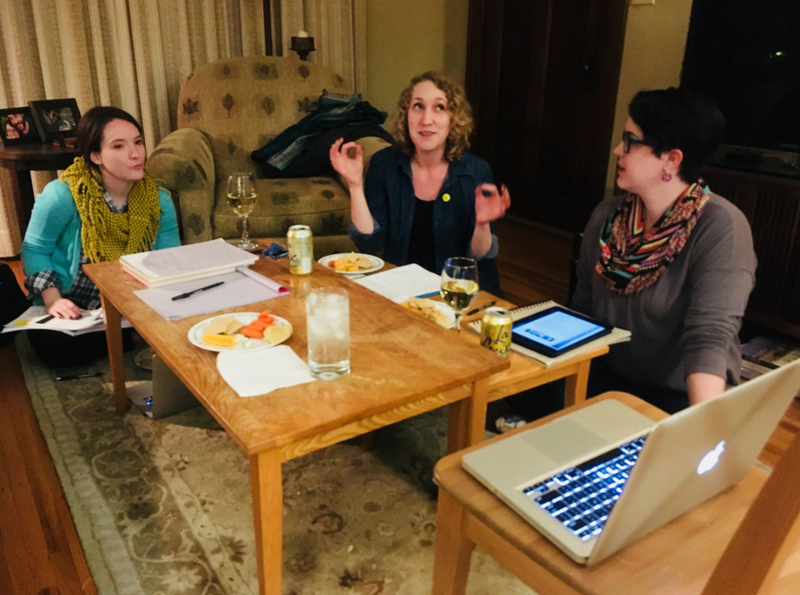 Dramaturgs are often asked to enter the process somewhere around the halfway mark, when the play is still unfinished but has a strong identity and its core has essentially already been formed. However, this has not been the process of Le Cirque, where I have been on board and part of the collaboration since before there was a script, and that has personally been both a thrilling and intimidating change. In exercising dramaturgical skills in a more generative way, I have found myself using different creative muscles, considering design elements in a way that I never had before, and feeling that pieces of myself have landed in the characters. 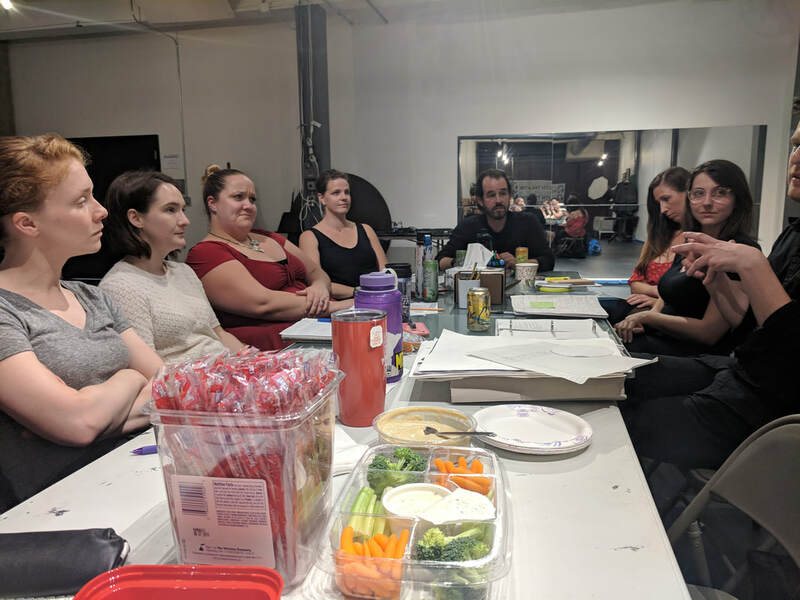 This exploration into a new area of dramaturgy started with the weekly research group that met in October and November to discuss the play’s historical context, read fairy tales, and consider visual research that would inspire the piece. I loved that even the research for this piece was collaborative. The social component yielded different results than what one brain would come up with, and the pool of minds allowed us to expand our research into deeper terrain. From these discussions came the first drafts of the script in December. 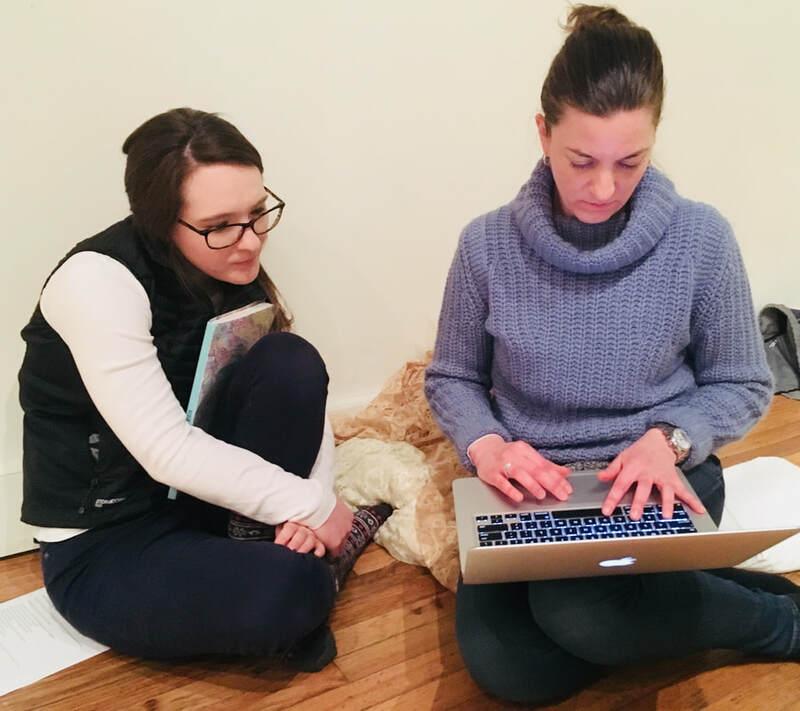 (L-R) Alison Ruth and Emily Dendinger discuss the script during the February workshop. 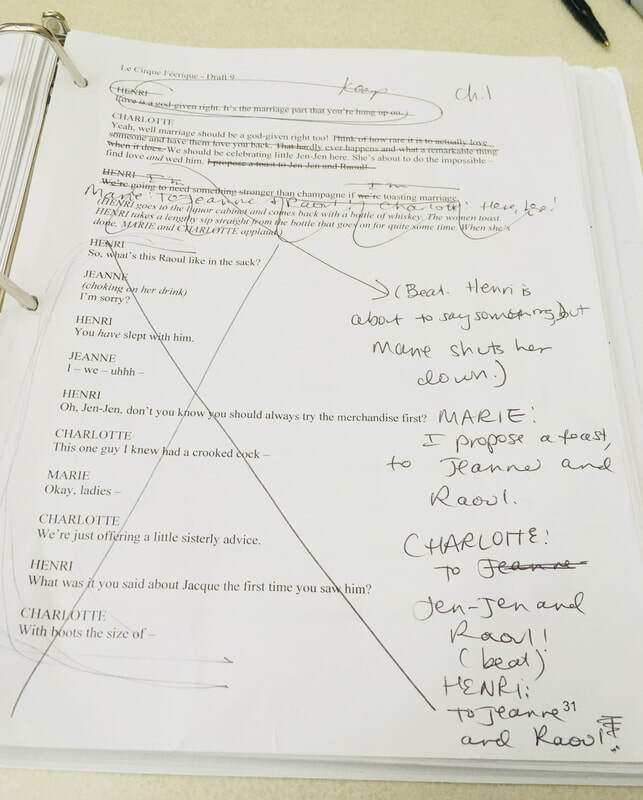 A couple months later, after many hours of thinking, talking, reading about the source material, and then eventually discussing the newly-written script, it became clear that what the play required for further development was to move away from the cerebral and into the physical. 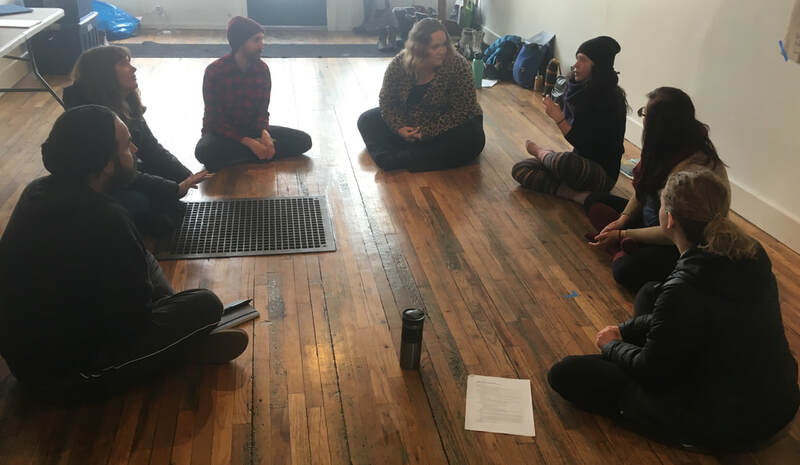 The Collective Unconscious model knows this, and I loved that just as I was starting to itch for performers to embody these characters who had only lived on the page and in our imaginations thus far, a week-long workshop with actors was planned. 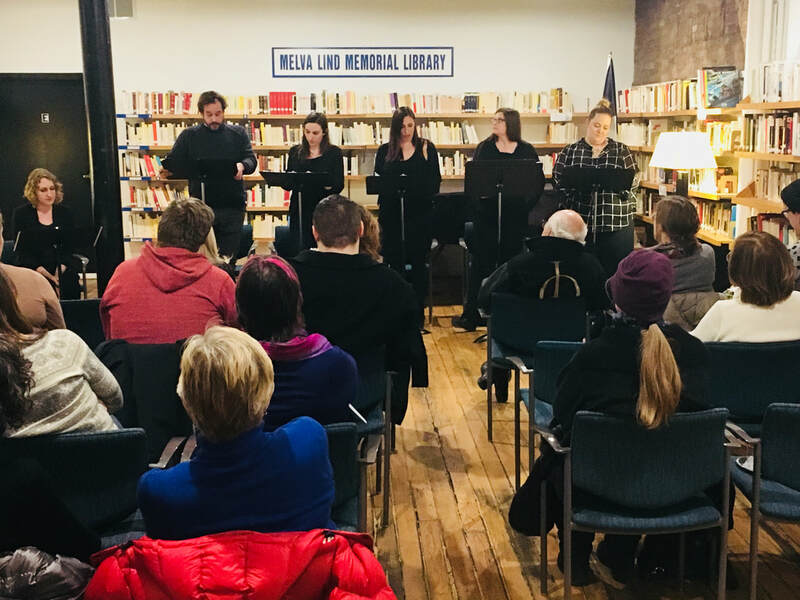 (L-R) Sofia Lindgren Galloway, Leif Jurgensen, Parker Sera, Katherine Kupiecki, Heather Stone, and Sarah Modena performed in a reading of Le Cirque Féerique in February 2018 at the Alliance Française in Minneapolis. 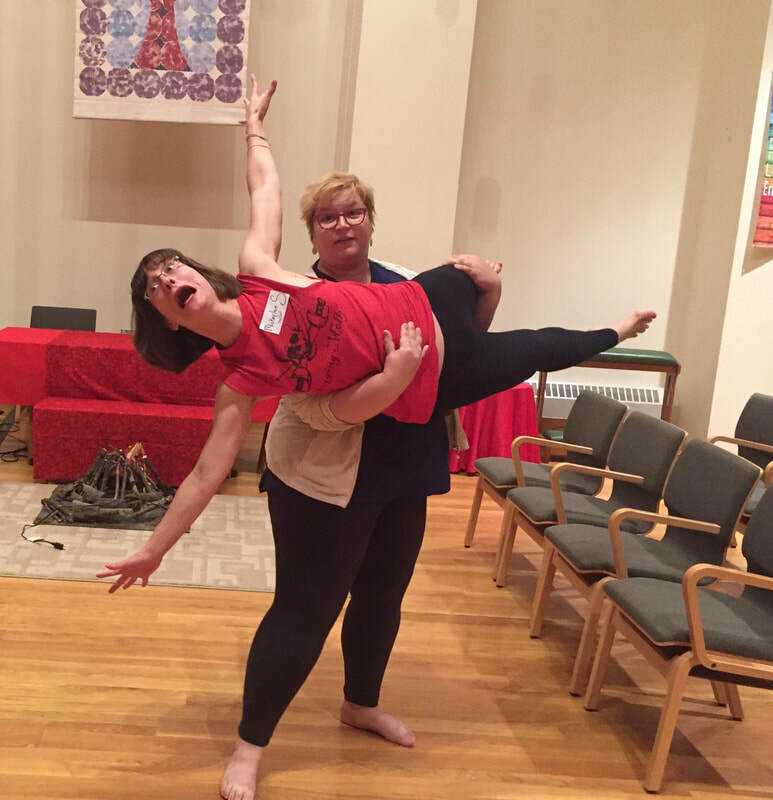 I learned a lot about the play at the first workshop in February. One of the most striking realizations was just how funny the characters were! Watching the actors zip through Emily’s witty dialogue illuminated aspects of the characters that I had not considered, and cleared up questions of pacing. Several months, drafts, and many conversations later, we entered a second workshop at the beginning of June. 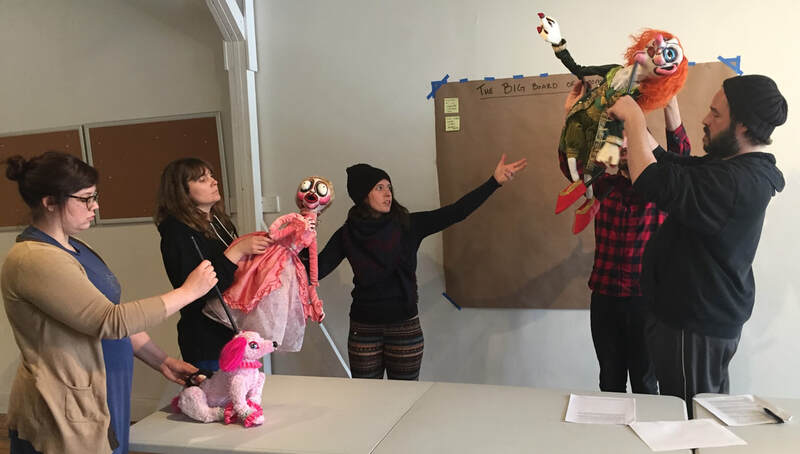 And in addition to the new questions, observations, and realizations of the actors, which is all fun and interesting, an even newer and more thrilling experience occurred: we devised with puppets. 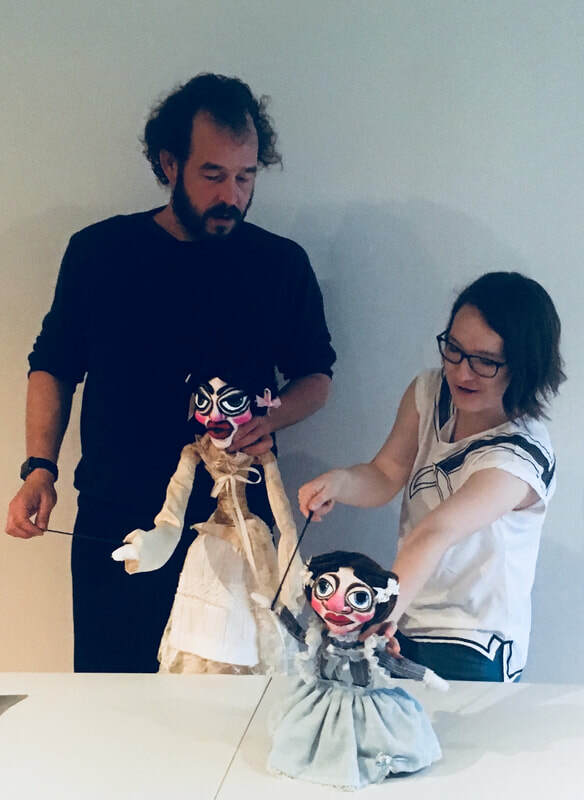 (L-R) Leif Jurgensen and Alison Ruth devise a scene with puppets during the June 2018 workshop. Hesitant to give too many things away, I will just say that devising with puppetry has again altered and expanded what I thought was possible for the play. Perhaps someone more imaginative than I could have dreamed where this play would go, but I suspect the process has surprised all of the collaborators on the Le Cirque team. I think we are all slightly amazed with what the work has turned into and how far we’ve come. I’m excited for what lies ahead during our rehearsal process this coming fall! Announcing the cast of "Le Cirque Féerique"
We are thrilled to unveil the amazing cast and production team for our next production - we hope that you're able to join us at the Art Box this coming October! 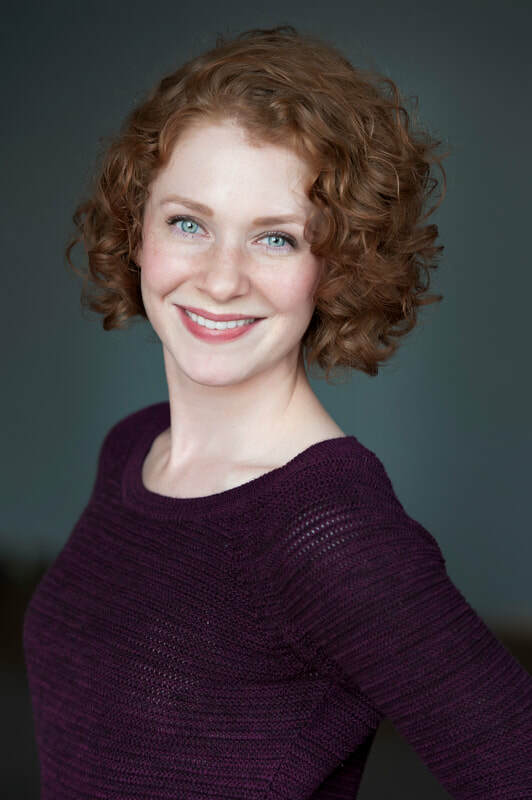 This past fall, I had the pleasure of co-directing the short film Little Red with NYC-based filmmaker Laura Lechner. 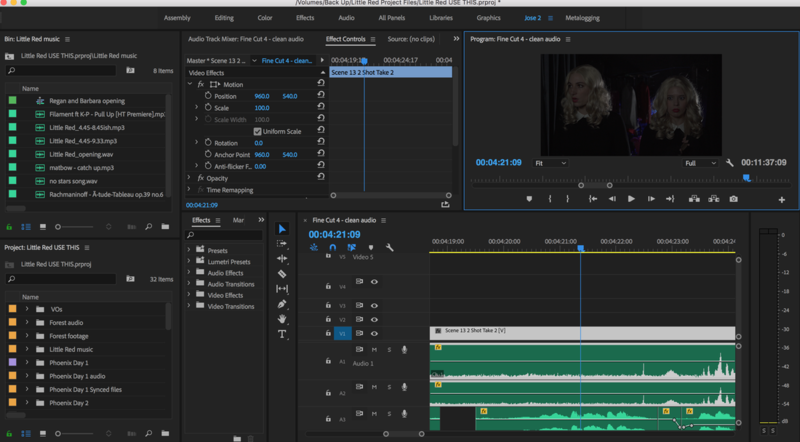 As a complete newcomer to filmmaking, the months we have spent editing in post-production is a totally new process for me and almost feels like an endless series of "tech weeks" for this theatre veteran. ;-) While we work toward a final edit of this short (coming to you this April! 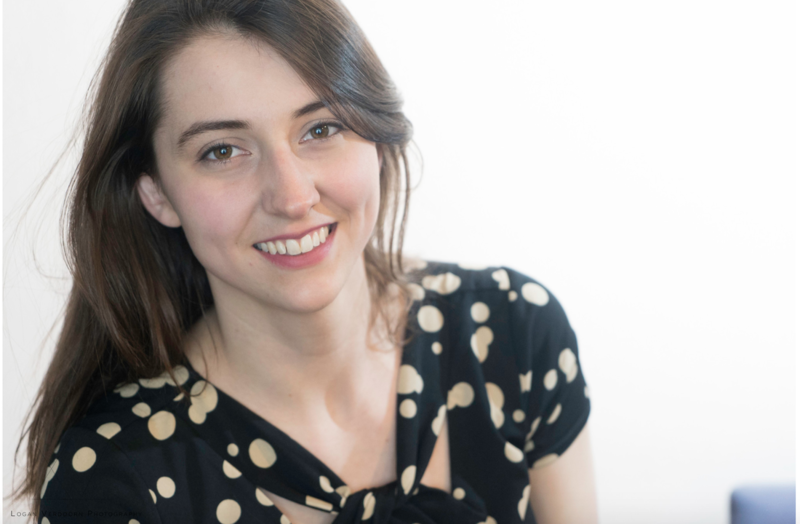 ), I'm delighted to bring Laura on to our blog and have her give you an update on our editing process. Onward! I've always wanted to experiment with puppets on film, to see how (or if) puppets could be used in a cinematic way (as opposed to simply filming a live performance), and to see if I could achieve the same emotional impact with puppets as with actors on screen. 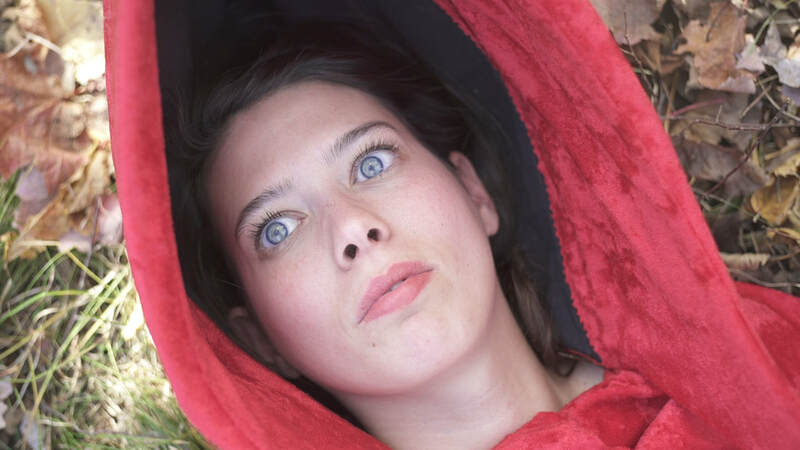 Collaborating with Collective Unconscious Performance on Little Red has been a worthwhile challenge, as we’ve worked to see how much story and emotion we can convey by employing the vocabulary of cinema within a world of puppets and masks. David and I have been working on this short film for almost a year. David originally began developing Little Red as a live puppet performance piece. When he shared his storyboards with me, something clicked: we both thought that the play had the potential to be even more compelling as a film. I’ve known David since 2010, and we’ve worked on a variety of projects together over the years, so I was very excited for another opportunity to collaborate. This, however, was our first time managing a long-distance (working) relationship: I’ve lived in New York for the past four years, and David is in Minneapolis. Outside of four days together in Minneapolis this past October for principle photography, we’ve managed to realize this film while not being in the same physical space! We spent the spring and summer writing and fine-tuning the script (thank god for Google Docs! 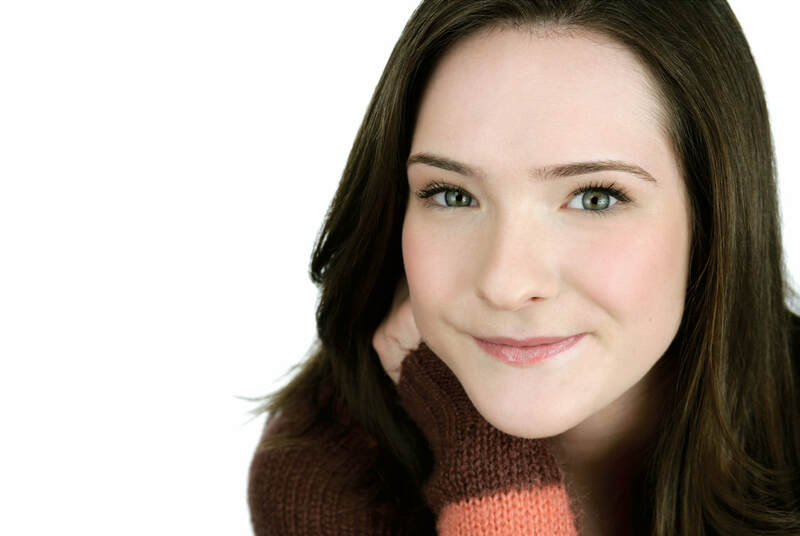 ), while we were also casting, location scouting, raising some funds, and doing all manner of pre-production work. David was also designing and fabricating the puppets and costumes, and I was working out camera and lighting possibilities with our cinematographer, Joe Valenzuela. After we wrapped up shooting in mid-October, I went back to New York, and I began to edit the film, sharing cuts with David along the way for his invaluable feedback. A cliche in filmmaking is to say that a movie is made three separate time - when the script is written, when you’re shooting it, and when you’re editing it. And it’s definitely true - by the end of that process, your film is always different than what you imagined when you were simply putting words down on a page. I for one think this almost always creates something a lot more interesting, and it’s probably my favorite part of the filmmaking process. In Little Red, we played with the order of several key scenes in the beginning, trying a variety of different combinations until we found an order that made our story more cohesive, and that served the character development, even with minimal dialogue. 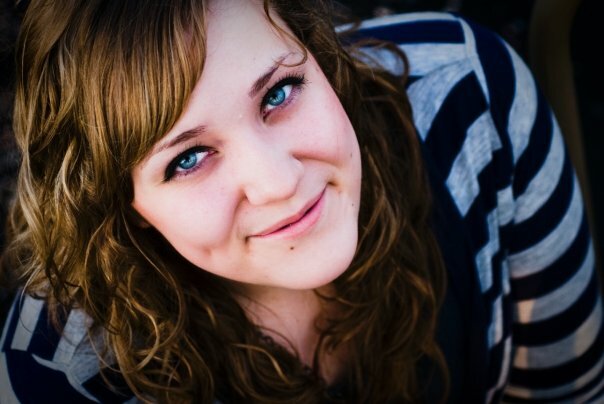 In addition to editing the picture, the other main component is sound design and audio editing. Another film school cliche is that your audience will forgive bad picture quality, but not poor sound. 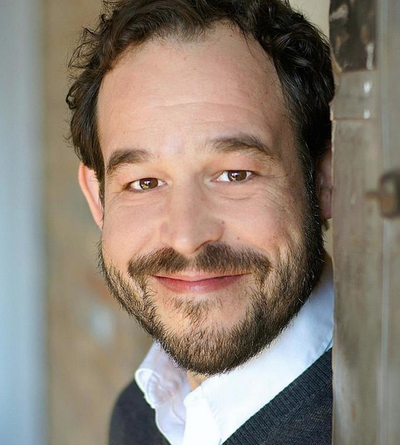 Dan Dukich has been composing original music for the film, as well as collaborating with us on the sound design. It’s incredible how transformational music and sound can be in a film. It’s as crucial an ingredient as beautiful imagery and profound acting. "There’s a great deal of mystery in film editing, and that’s because you’re not supposed to see a lot of it. You’re supposed to feel that a film has pace and rhythm and drama, but you’re not necessarily supposed to be worried about how that was accomplished. And because there is so little understanding of what really great editing is, a film that’s flashy, has a lot of quick cuts and explosions, gets particular attention . . . That’s so dramatic, and you can really see the editing there, but for me . . . the more interesting editing is not so visible. 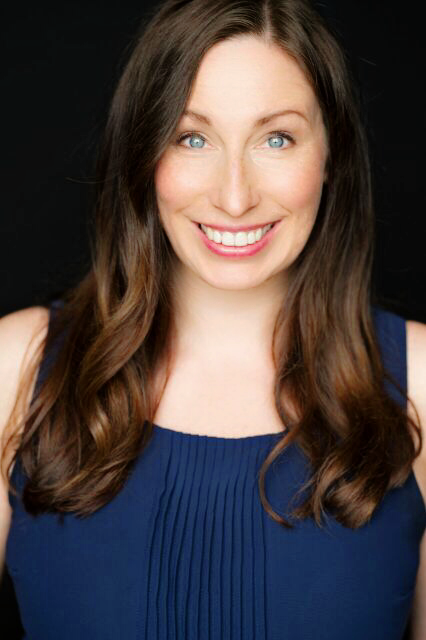 It’s the decisions that go into building a character, a performance, for example, or how you rearrange scenes in a movie, if it’s not working properly, so that you can get a better dramatic build." 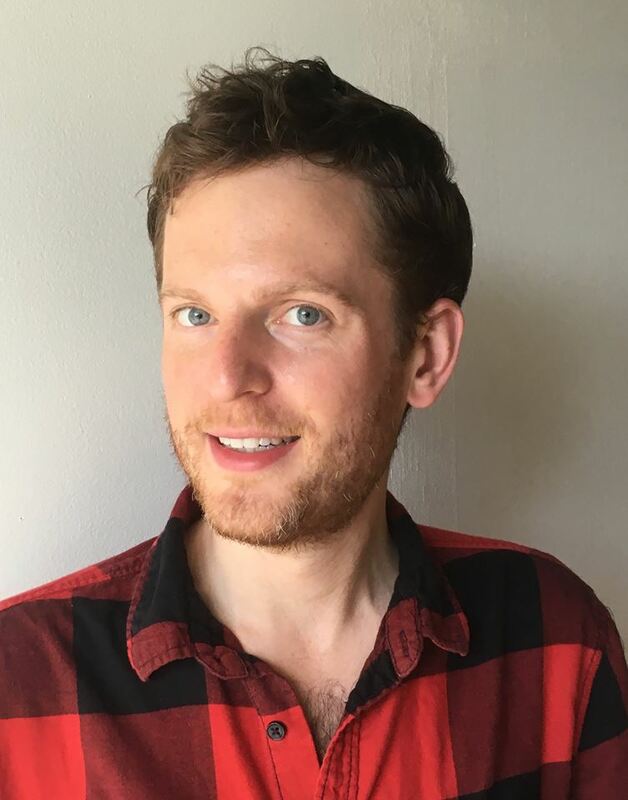 ​Collaborating with David on Little Red has been a great experience, and I know I speak for the two of us (and the cast and crew) when I say that we’re VERY excited to share our film with you this coming April!